At Sail Wild Hearts, we try to offer a number of experiences to entertain everyone in your crew. From our romantic sunset sails to our family adventure cruises, there’s something for everyone aboard our catamaran. Returning March 20 is a perennial favorite of folks of all ages: our Dolphins & Blue Angels Sail. We invite you to join us for a once-in-a-lifetime experience of spotting dolphins in the wild aboard Sail Wild Hearts! We’ll head out toward Pensacola to catch sight of our local dolphin population in their natural habitat. While on board, fill up on breakfast and learn facts you’ve always wanted to know about dolphins. Bottlenose dolphins are some of the smartest and friendliest animals on the planet. Did you know these incredibly fast swimmers have two stomachs and live up to 50 years? Feel free to ask questions and our crew will give you the scoop while you snap gorgeous pictures and make memories to last a lifetime. 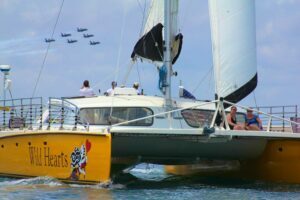 In addition to spotting dolphins in the wild, our cruises include a unique view of the Blue Angels’ heart-stopping escapades, a sail to a historic Civil War fort in a protected lagoon, snorkeling, kayaking, paddleboarding and more. Just pick the adventure you are seeking! There’s no reason learning – or the fun – should stop during spring break. A cruise with Sail Wild Hearts is the perfect way to keep learners of all ages engaged in the world around them even when school’s out.